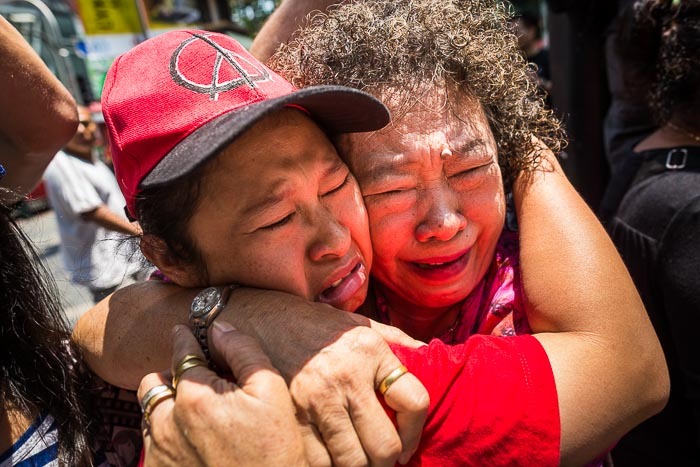 Supporters of the ousted, elected, government weep during a protest against the coup. 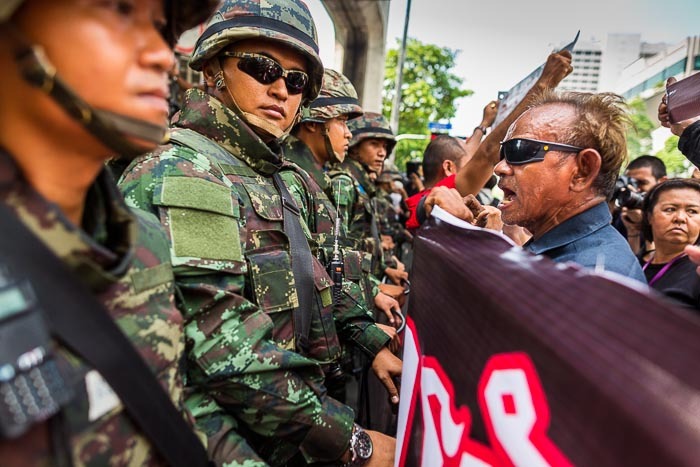 Protests against the coup in Thailand continued and became more widespread Sunday. Where the Saturday protests had hundreds of people marching against the army, Sunday's protests had thousands. Soldiers were more tense Sunday and tried to make some arrests, but things were still largely peaceful. A soldier screams at protestors. The leaders of the coup seem to be growing more impatient with the street protests. They've warned protestors that the army could use force if the protests continue and started arresting (or detaining) academicians and journalists. 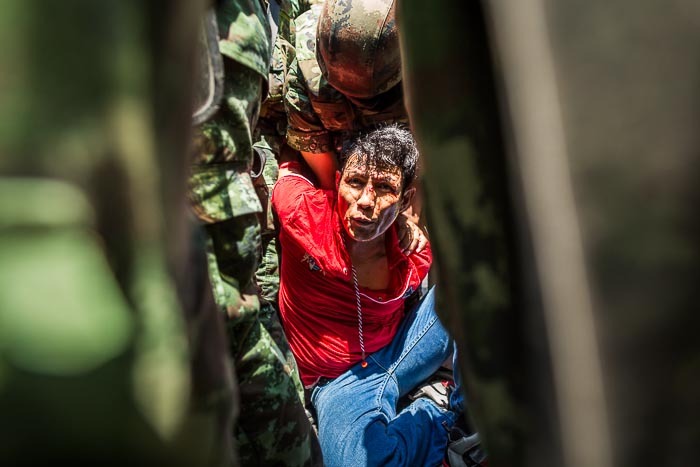 A "Red Shirt" supporter of the ousted, elected, government in army custody. Sunday protests started at a McDonald's restaurant in Ratchaprasong. Protestors thought they had chased soldiers away were celebrating their victory when a convoy of army reinforcements arrived. Protestors tried to confront the soldiers but instead decided to march to Victory Monument, a short distance away. They continued the protest at Victory Monument for a couple of hours before breaking up ahead of curfew. 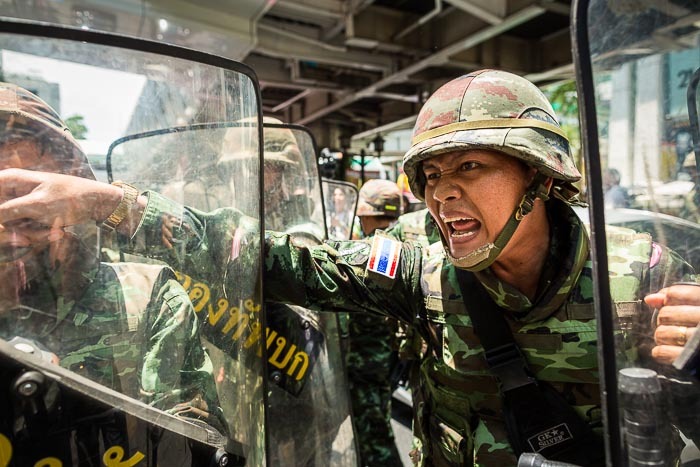 Protestors confront soldiers in Ratchaprasong. There are more photos from Sunday's protest in my archive or available from ZUMA Press.